Now we are thinking it to take a level further by expanding nanoPAD2's capability to control multiple parameters using the existing available controls. This can be easily done using software capabilities. We have been trying on various software to get this capability but according to us the best possible way to achieve this is using MAX/MSP for Live (M4L). We tried to work on a patch that would allow user to emulate nanoPAD2's XY pad to send four signals instead of just two thus to simulate MF3D motion signals for forward, backward, left and right. But since we are really new into scripting for M4L we are really looking forward to get some help from community. So if any of you know someone that can work on a patch as described below, please share this with them, it will be of great use for everyone in the community. If you yourself can work on max for live patches we request you to please work on this and share it with the community! 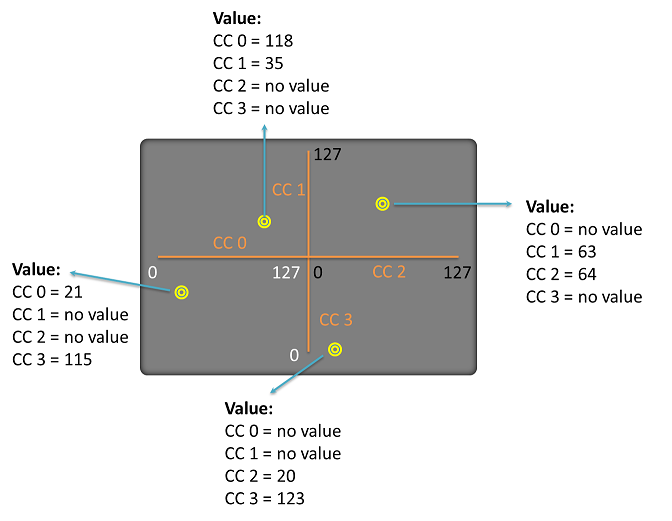 XY pad sends to control change messages CC1 and CC0 respectively. And these messages range from values 0 to 127 for both the CCs. Which in turn allow us to control any two controls. In order to send four signals that can emulate the MidiFighter 3D mothion controls we should have the XP pad send messages as shown below. 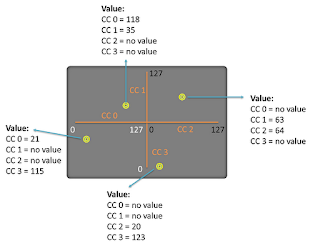 The center point will be 0 for all CC messages and going from center to any direction will increment the CC message value. We request you all to share your knowledge and help us users to take nanoPAD2's to the next level of controllerism. Please! spread the word!